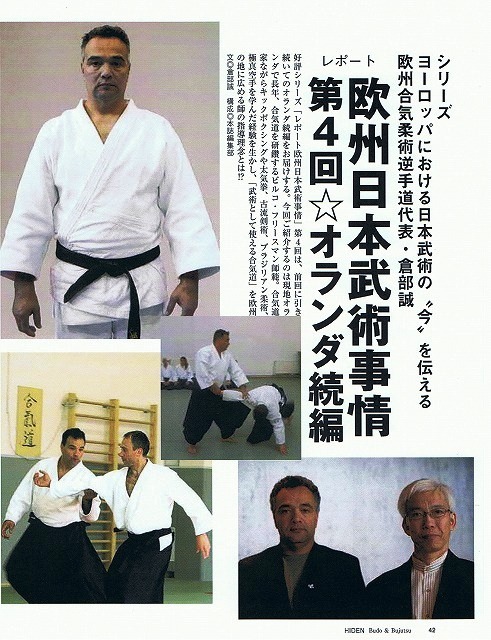 Series of article titled “BUDO report from Europe” started in Japanese monthly Budo Journal “HIDEN” published by BAB Japan. Seek for a person who teaches Japan originated BUDO, especially JUJUTSU, in Europe so that I can introduce his/her activity in my series article. Now I covered Poland, Nederland and Belgium by total 6 articles, so my next target is Germany, France and other near countries. Anybody who are dedicated his/her life to develop and to promote true Japanese BUDO with pure BUDO spirits but not for profit making purpose in those area, please get contact with me. (info@gyakutedo.com).